Mondzelewski et al determined the effect of steep Trendelenburg (sTBURG) surgical position on IOP during robotic-assisted laparoscopy (RAL) in patients without previously identified ocular disease. The prospective, cohort study measured IOP in 18 patients undergoing RAL with sTBURG and 21 controls undergoing open or laparoscopic surgery in the horizontal position. The main outcome measures were IOP, change in the thickness of the retinal nerve fiber layer (RNFL) on optical coherence tomography (OCT), Humphrey visual field (HVF; Carl Zeiss Meditec) mean deviation, and HVF pattern standard deviation. Baseline ophthalmologic examinations were similar between groups for IOP, pachymetry, OCT RNFL, HVF mean deviation, and HVF pattern standard deviation. The investigators reported a significant increase in IOP in patients who underwent robotic surgery compared to those who underwent laparoscopic or open procedures. Patients in the RAL group reached an IOP plateau more than twice the mean baseline IOP (13.7 ±3.2 mm Hg). The IOP plateau from 60 minutes until conclusion of the case was 29.9 mm Hg in the sTBURG group compared to 19.9 and 22.8 mm Hg for the open and laparoscopic groups, respectively. One hour postoperatively, the IOP remained significantly elevated for patients undergoing RAL (30 mm Hg) compared to control groups (19 and 22 mm Hg, respectively). One month postoperatively, the IOP normalized to baseline with no statistically significant changes in RNFL thickness, HVF mean deviation, or HVF pattern standard deviation. A few studies have shown that IOP is directly related to the degree of inclination.3,4 The inclination in this study was 30º. Some surgeons tilt their patients 45º during the surgical procedures, which would result in higher IOPs. Previous studies have confirmed that IOP rises during RAL radical prostatectomy.5,6 Unlike other studies, this research by Mondzelewski et al included two control groups in which IOP was measured in patients undergoing open or laparoscopic procedures in the horizontal position. The range in IOP in patients undergoing RAL compared to a horizontal position was quite wide. Readings from 17 to 53 mm Hg were seen 60 minutes into the RAL procedure, and ranges of 24 to 52 mm Hg and 24 to 55 mm Hg were measured at 150 and 240 minutes, respectively. One hour after the procedure, an IOP from 17 to 53 mm Hg was measured. Peak IOPs in the control groups were lower than in the sTBURG group and measured 30 and 35 mm Hg 150 minutes into open and laparoscopic surgery, respectively. The drastic elevation in IOP in patients with relatively healthy eyes over several hours is alarming. Studies have concluded that patients with glaucoma are susceptible to IOP fluctuation with positional changes and that the more advanced the disease, the more vulnerable a patient is to positional impact on IOP.3,4 In patients with glaucoma, the range could be even greater. 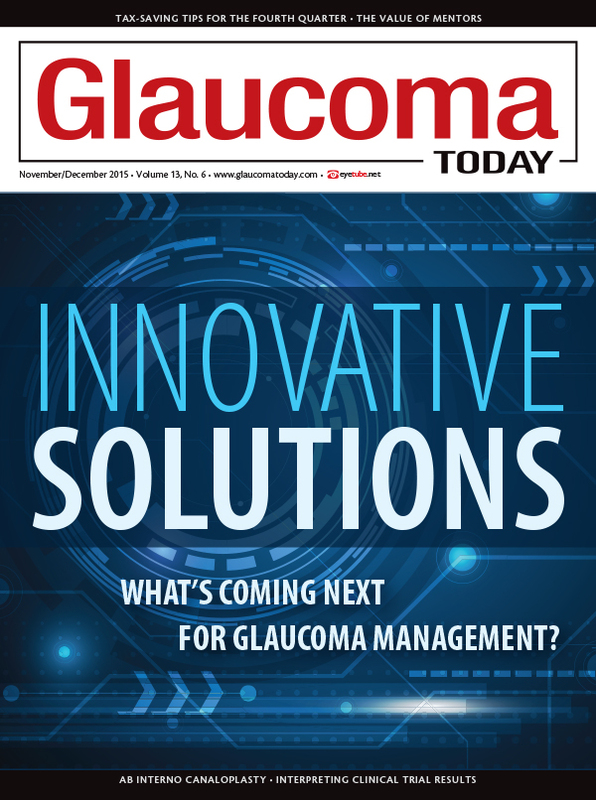 Short-term IOP spikes in patients with moderate to advanced glaucoma may lead to disease progression and loss of vision. In the future, as more patients with advanced disease undergo RAL, close monitoring of their postoperative IOP, RNFL thickness on OCT, HVF mean deviation, and HVF pattern standard deviation will be required. This study evaluated patients with healthy eyes 1 month after surgery and found minimal change in the primary endpoints. The results of long-term studies in patients with advanced disease who undergo this procedure will help guide management in the future. A careful discussion with the urologist about the length of procedure, the angle of inclination, and the possibility of doing an open procedure given the risk of vision loss may also be indicated for patients with advanced glaucoma. Freund et al assessed changes in IOP in patients with neovascular age-related macular degeneration (NVAMD) receiving intravitreal aflibercept injection (IAI [Eylea; Regeneron]) or ranibizumab (Lucentis; Genentech) in the VEGF Trap-Eye: Investigation of Efficacy and Safety in Wet AMD (VIEW) 1 and 2 studies. The investigators analyzed data from two randomized, active-controlled, phase 3 trials. A total of 2,457 patients with NVAMD were evaluated. Patients received IAI 2 mg every 4 weeks (2q4), 0.5 mg every 4 weeks (0.5q4), 2 mg every 8 weeks (after 3 monthly doses; 2q8), or ranibizumab 0.5 mg every 4 weeks (Rq4) for 52 weeks. Preinjection IOP was analyzed in the study and uninjected fellow eyes from baseline to week 96. Prespecified endpoints included the mean change in IOP from baseline and a prevalence of IOP increases from baseline of more than 10 mm Hg. The cumulative incidence of a sustained (at 2 consecutive visits) IOP greater than 21 mm Hg, a single event of an IOP higher than 25 mm Hg, and a sustained IOP increase from baseline (> 5 mm Hg) was also evaluated. The mean change in IOP from baseline over 96 weeks in all IAI groups was consistently lower than in the Rq4 groups, and this finding was replicated in both trials. The percentage of study eyes with IOPs higher than 21 mm Hg at week 96 was 20.2%, 14.2%, 12.1% and 12.5% in the Rq4, 2q4, 2q8, and 0.5q4 groups, respectively. The percentage of study eyes with a change of more than 10 mm Hg at week 96 was 6.4%, 2.9%, 3.1%, and 3.8% in the Rq4, 2q4, 2q8, and 0.5 q4 groups, respectively. Post hoc analysis of two other large antivascular endothelial growth factor clinical trials, ANCHOR (Anti-VEGF Antibody for the Treatment of Predominantly Classic Choroidal Neovascularization in AMD) and MARINA (Minimally Classic/Occult Trial of the Anti-VEGF Antibody Ranibizumab in the Treatment of Neovascular AMD), concluded that intravitreal ranibizumab or bevacizumab (Avastin; Genentech) can increase IOP in 3.5% to 8.5% of patients.8 Freund et al found that IOP increases were low and similar among all IAI groups. Rq4 patients experienced higher IOP increases compared to IAI patients, but the increases in IOP observed by Freund and colleagues were similar to a previous report,8 around 5%. Section Editor James C. Tsai, MD, MBA, is president of New York Eye and Ear Infirmary of Mount Sinai and chair of ophthalmology for the Mount Sinai Health System in New York. Dr. Tsai may be reached at jtsai@nyee.edu. Paul Lee, MD, is chief of ophthalmology, James J. Peters VA Medical Center, Bronx, New York, and clinical assistant professor of ophthalmology, Icahn School of Medicine at Mount Sinai in New York. He acknowledged no financial interest in the product or company mentioned herein. Dr. Lee may be reached at (917) 679-3259; drpaulee@gmail.com. 1. Mondzelewski T, Schmitz JW, Christman MS, et al. Intraocular pressure during robotic-assisted laparoscopic procedures ytilizing steep Trendelenburg positioning. J Glaucoma. 2015;24:399-404. 2. Barbash GI, Glied SA. New technology and health care costs—the cost of robot-assisted surgery. N Engl J Medicine. 2010;363:701-704. 3. Prata TS, De Moraes CG, Kanadani FN, et al. Posture-induced intraocular presuure changes: considerations regarding body position in glaucoma patients. Surv Ophthalmol. 2010;55:445-453. 4. Linder BJ, Trick GL, Wolf ML. Altering body position affects intraocular pressure and visual function. Invest Ophthalmol Vis Sci. 1988;29:1492-1497. 5. Awad H, Santilli S, Ohr M, et al. The effects of steep Trendelenburg positioning on intraocular pressure during robotic radical prostatectomy. Anesth Analg. 2009;109:473-478. 6. Molloy BL. Implications for postoperative visual loss: steep Trendelenburg position and effects on intraocular pressure. AANA J. 2011;79:115-121. 7. Freund KB, Hoang QV, Namrata S, Thompson D. Intraocular pressure in patients with neovascular age-related macular degeneration receiving intravitreal aflibercept or ranibizumab. Ophthalmology. 2015;122:1802-1810. 8. Bakri SJ, Moshfeghi DM, Francom S, et al. Intraocular presuure in eyes receiving monthly ranibizumab in 2 pivotal age-related macular degeneration clinical trials. Ophthalmology. 2014,121:1102-1108. 9. Jampel H, Kalenak J. Anti-vascular endothelial growth factor injections and intraocular pressure measurement: should we throw the baby out with the bath water? Ophthalmology. 2015;122:1735-1736. 10. Medeiros FA, Thomas R, Mansburger S, et al. Clinical Trials and Intraocular Pressure (Reports and Consensus Statements of the 4th Global AIGS Consensus Meeting on Intraocular Pressure). Amsterdam: Kugler Publications, 2007.